The perception of digital media and electronic arts has changed. These media once caused riots; they once earned angry cries of artificiality (even the very term “synthesizer” was derogatory). They alarmed and shocked even recently. And then, more recently, use of raw digital sounds, of glitches and hard edges, were seen even by digital art critics as commentary on the digital life. Something has happened. It’s not just young people for whom this stuff is “native.” It’s all of us. And it should come as no surprise that people carrying powerful computers with an array of sensors in their pockets would start to react differently. I think Ryoji Ikeda’s work is especially powerful in this regard. “Test Patterns” uses barcodes – images that once had nasty associations with dystopian futures and dehumanization. But people are bathed in the sensory qualities of light and sound, sprawled on the ground as if they’re spending a Sunday afternoon in the park. It’s as though everyday people have risen to the aesthetic desires of early futurists and avant-garde, ready to immerse their eyes and ears in media in its purist form. At least, that’s how I respond to this virtual tour of the vernissage in Duisburg, Rhine-Westphalia, Germany. Have a look at this beautifully-shot footage and see what your take may be. Source: Wonge Bergmann für die Ruhrtriennale 2013. 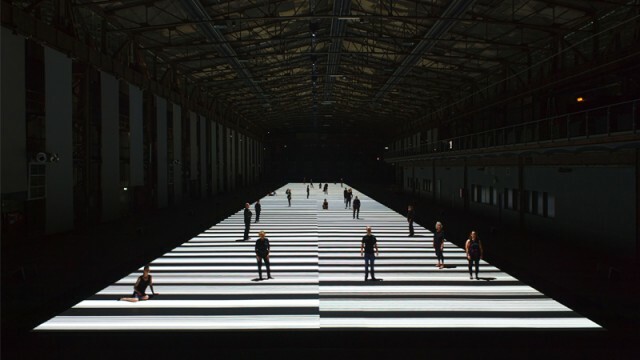 In this video we attend the opening of Japanese artist and composer Ryoji Ikeda’s audiovisual installation “Test Pattern [100m Version]” at Duisburg’s Kraftzentrale, within the framework of Ruhrtriennale — International Arts Festival. Ikeda’s work translates the digital data that surrounds us in everyday life into flickering barcodes. On the artist’s 100-meter-long projection, the visitor is at the same time viewer and part of the image. The installation is accompanied by a rhythmical soundtrack. Concept and composition are by Ryoji Ikeda, computer graphics and programming by Tomonaga Tokuyama. 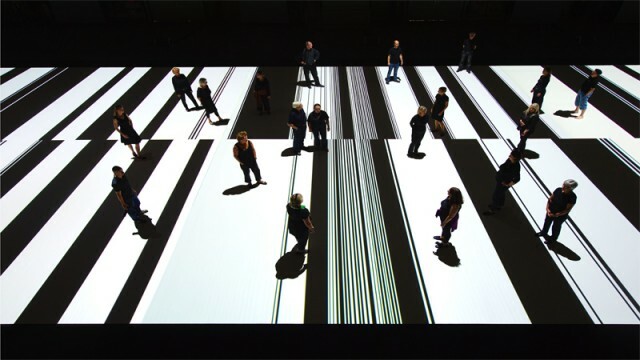 Ryoji Ikeda 池田亮司: Test Pattern 100m Version at Ruhrtriennale 2013. Opening, August 22, 2013.